There is a legend about the panda’s black spots. A popular Chinese myth tells that pandas were originally completely white. One day, however, when the youngest of four sisters died, the other sisters dipped their hands in ash to mourn their loss. Weeping, they rubbed their eyes to wipe away the tears, hugged themselves in consolation and covered their ears so as not to hear the weeping. Legend has it that the ashes remained as spots on their fur. 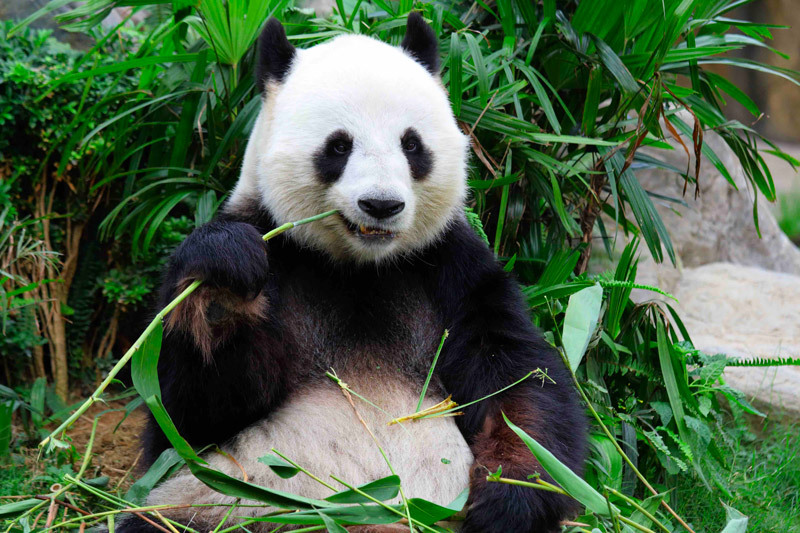 The panda lives in central China in the cold and humid bamboo forests at high altitude. 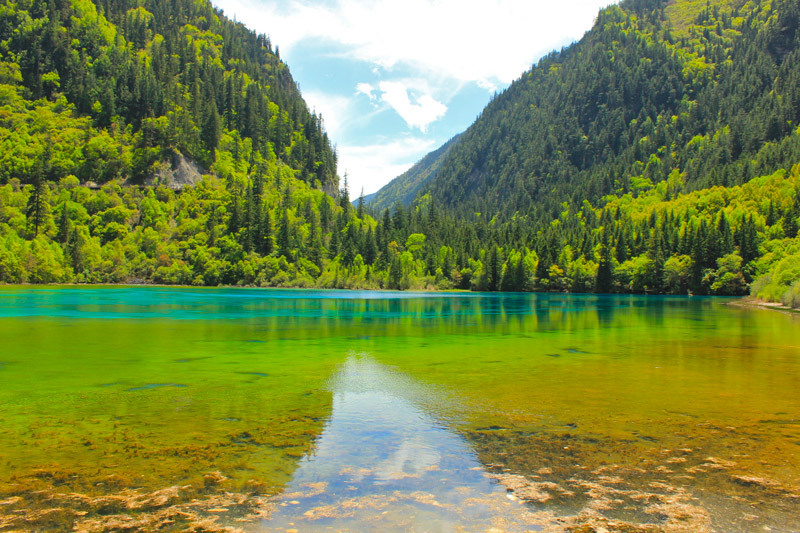 They are found in three regions: Sichuan Province and part of Shaanxi and Gansu. China is the only country that is home to pandas. The panda is a mammal of the Ursidae family (plantigrade locomotion mammals, which includes the bear). It weighs between 80 and 125 kg and can measure up to 1.80m, averaging about 1.65m. Its fur is black and white and very thick to protect it from the cold. The panda has 6 fingers with a fake thumb that is actually a sesamoid bone belonging to the wrist, effective in gathering bamboos stalks. 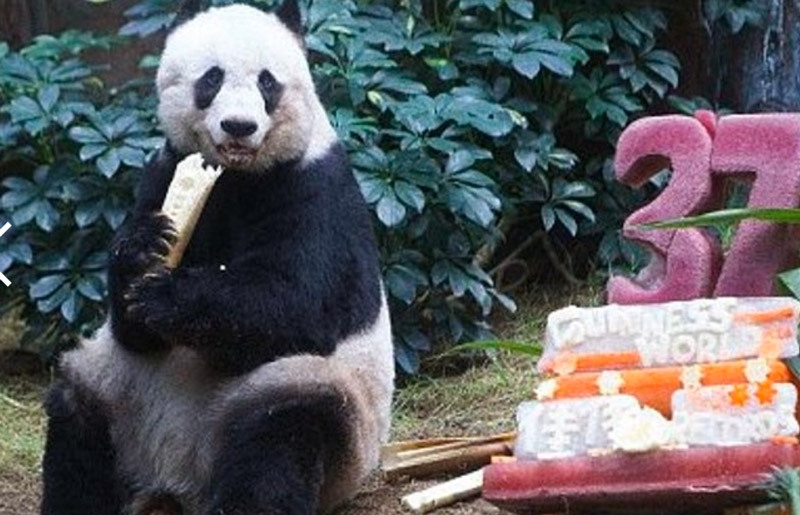 This herbivore has 42 strong teeth to grind the bamboo. Its hearing and sense of smell are highly developed, facilitating orientation because its sight is rather poor. 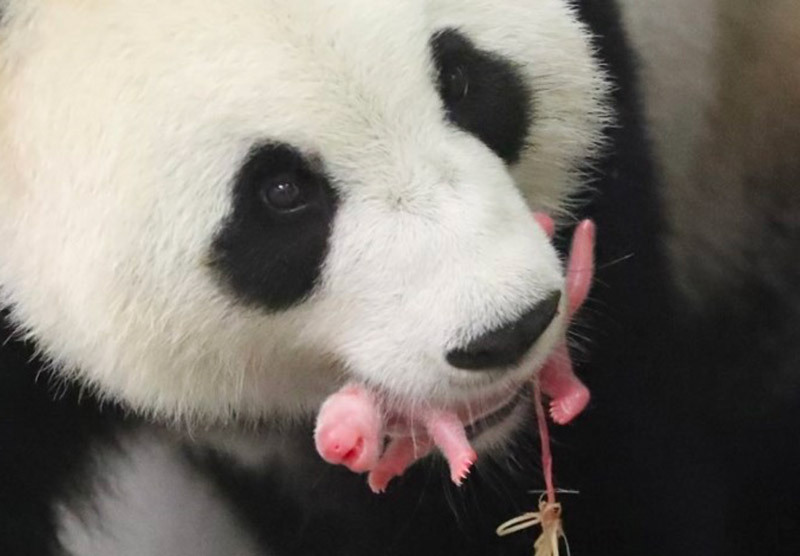 Pandas eat up to 20 kg of bamboo per day. Swallowing the shoots entirely, it spits out the bark to keep only the best part which is in the heart of the stem. 99% of the diet consists of plants and the remaining 1% may include meat, eggs or insects. The fact that the panda was originally a carnivore explains why the digestive system is able to assimilate animal protein. The panda reaches sexual maturity at the age of 5 to 6 years. It can reproduce for only a few days each year. The length of gestation is between 112 and 163 days, giving birth to one to two cubs. The cub weighs between 85 and 140 grams at birth and has pinkish skin with very little fur. Its sight develops after 45 days. The mother looks after it on her own for 1 year, which is the time it takes to wean. The panda becomes autonomous at 18 months. Life expectancy in captivity is 20 to 25 years. Jia Jia, a female resident at the Ocean Park zoo in Hong Kong, holds the record for longevity at 38 years. In its natural environment where other factors come into play, life expectancy is estimated at about 15 years.